...which features three days of action. The unofficial start to what promises to be an unforgettable season of full fields and unprecedented manufacturer involvement got going with the annual IMSA Media Day at Daytona International Speedway on Thursday. Series regulars and special guest stars for the Rolex 24 turned out in force to participate in photo shoots and interview sessions throughout the day with media from the United States and around the world, including IMSA’s new broadcast partner - NBC. The feeling of anticipation was palpable among the many IMSA WeatherTech SportsCar Championship Daytona Prototype international (DPi), LMP2, GT Le Mans (GTLM) and GT Daytona (GTD) making the media rounds. “It’s just amazing,” said Dirk Mueller, 2017 Rolex 24 GTLM winner and co-driver of the No. 66 Ford Chip Ganassi Racing Ford GT with Joey Hand and Sebastien Bourdais. “I don’t know how long we’ve been saying, ‘It’s the best championship, it’s the best championship, it’s the best championship.’ It is the best championship, that’s for sure. It keeps on getting better and better. The green flag falls on the first WeatherTech Championship practice session of the season Friday at 11 a.m. ET. The weekend also features an IMSA Prototype Challenge race Saturday beginning at 12:15 p.m. The three-hour race can be seen on IMSA.TV and heard on IMSARadio.com. Ticket holders for the Rolex 24 At Daytona are admitted free while tickets are available for the event at daytonainternatonalspeedway.com. 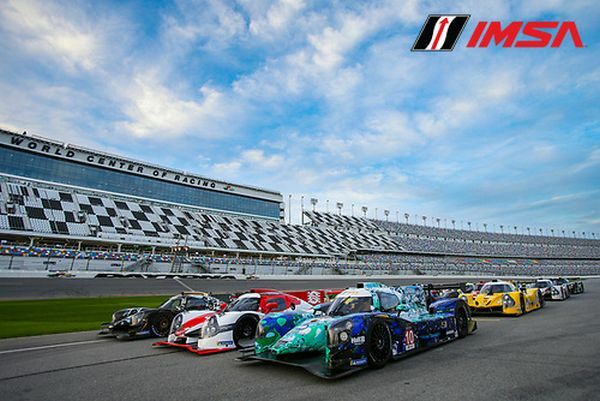 While there have been plenty of glimpses of what is in store for IMSA’s 50th Anniversary in 2019, the official start to the celebration begins this weekend at the Roar Before the Rolex 24. The celebration will last throughout the season in each championship. The four cornerstones of the golden anniversary include Drivers & Teams, Tracks, Manufacturers and Fans. During the year there will be many opportunities for fans to reive their IMSA memories to see historical cars and meet drivers from the past. Many teams and manufacturers have already announced plans to run historical liveries during the year. IMSA released a commemorative book in August entitled “IMSA: Celebrating 50 Years.” The 216-page book is available for purchase and contains the stories of the drivers, cars, teams, manufacturers, events and executives that make up the storied history of IMSA. The book tells the story of its formation between John and Peggy Bishop and Bill France, Sr., to the first race at Pocono in 1969, to its current standing as a highly regarded sanctioning body that will lead seven motorsport platforms in 2019, including its flagship – the IMSA WeatherTech SportsCar Championship. IMSA also will be the featured marque at the annual Rolex Monterey Motorsports Reunion at WeatherTech Raceway Laguna Seca in August. Michelin begins its status as the “Official Tire Supplier” of IMSA this weekend as well as officially beginning its entitlement of the IMSA Michelin Pilot Challenge and the IMSA Michelin Endurance Cup which begins at the Rolex 24 At Daytona. IMSA also starts its six-year partnership with the NBC Sports Group in January to televise the WeatherTech Championship, which will feature an 80 percent increase of network coverage in 2019. A majority of programming (45 hours) will be broadcast on NBCSN and all races will be streamed on NBCSports.com and the NBC Sports App. Two of the three championship teams from the WeatherTech Championship will have new looks in 2019. The Prototype class champion from 2018 – the No. 31 Whelen Cadillac DPi-V.R., driven by Felipe Nasr and Eric Curran will have a new addition as Pipo Derani joins the team as a full-time driver in the team’s now Daytona Prototype international (DPi) class, with Curran joining the team for the four IMSA Michelin Endurance Cup rounds. The GT Daytona (GTD) class champion of the No. 48 Paul Miller Racing Lamborghini will have Ryan Hardwick joining champion Bryan Sellers. Hardwick enters the car as the World Final Champion in the AM class in Lamborghini Super Trofeo North America in 2018. The only champions without a change are the pair of Jan Magnussen and Antonio Garcia in the No. 3 Corvette Racing machine. The duo won the title without winning a race in 2018. Once again, the Rolex 24 At Daytona will feature some of the biggest names in motorsports. Two-time Formula 1 world champion Fernando Alonso made his Rolex 24 debut last year and is back in 2019 as part of the Wayne Taylor Racing No. 10 Konica Minolta Cadillac DPi alongside regulars Jordan Taylor and Renger van de Zande. They will also be joined by Kamui Kobayashi, Alonso’s teammate in the FIA World Endurance Championship. Alex Zanardi, the two-timeCART champion and former Formula 1 driver, makes his debut at Daytona in the Roar and the Rolex. Zanardi, driving for BMW, uses a specially-modified steering wheel and hand controls to drive after losing his legs in a Champ Car crash back in 2001. Since then, he has also become a multi-gold medalist in the Paralympics. After its successful debut with a race at the 2018 Roar, there once again will be an IMSA Prototype Challenge race over the weekend. The season-opener on Saturday, Jan. 5 will be the first three-hour race for the series, which shifts to a single-class LMP3 format in 2019 as well. It will start at 12:15 p.m. EST. The race can be seen on IMSA.tv and can be heard on IMSARadio.com and RadioLeMans.com. Roman De Angelis won the race in 2018 driving for ANSA Motorsports. Timo geht mit dem Mazda Team Joest bei der IMSA WeatherTech Sportscar Championship 2019 an den Start.